There are a lot of mobile Web development services out there. AzonMobile, however, gives you an edge. In the first part of this two-part series, we have already showed you how you could easily build a mobile Web site with us. Even if you do not know HTML. Here are some more reasons why you should use AzonMobile. Why not let your visitors tell your friends about you on their social media accounts? To make it easier for them to do just that, add social media buttons to your mobile Web site. This is a surefire way to attract their friends and contacts to come visit your site. 5. Let your customers contact you easily. AzonMobile's platform allows you to have an easy-to-configure click-to-call button. Now all your customers and potential buyers have to do is to click on a button to contact you! 6. Earn from your mobile Web site. You can easily monetize your mobile Web site with Adsense, and with AzonMobile, it is very easy to set up your AdSense account! 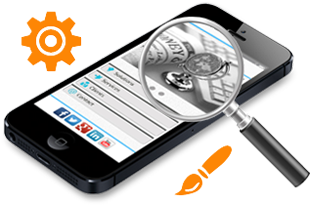 AzonMobile also allows you to make your mobile Web site easy to find on search engines. Doing SEO has never been this easy! Also, we are not only talking about search spiders, but real people, too. You can easily add a map to your store so that people who want to visit can do so. 8. Make it your own. You might think that working with a template and a drag-and-drop interface would put a crimp on your flexibility and freedom and would make your mobile Web site drab and unoriginal. Think again, because AzonMobile allows you to fully customize your site, from layout to backgrounds! 9. Take your site offline. With AzonMobile, you can easily generate a QR code for every page so that you can market any page of your mobile Web site offline. Now all your customers would have to do is to scan the QR codes they find on your business card, marketing flyers and brochures! AzonMobile aims to make mobile Web site development very easy for you. Not only that, we also incorporate best practices that touch on social marketing, QR codes and other technologies that you could use to your advantage in order to easily engage your customers!